Are Records Really Made to be Broken? I just finished reading John Eisenberg’s book called “The Streak.” You won’t find a better treatment of the subject of the record for consecutive games played in major league baseball. Eisenberg goes back into the 19th century at times, reviewing the “iron men” of the early days before a couple of guys named Gehrig and Ripken took over that title forever. After reading it, it’s easy to wonder about the nature of sports records. Do we put too much emphasis on them? If we do, we can blame the sports media for some of that. In the narrow sense, sports reporters love records. They do so because it makes their job easier. Someone sets a new standard for home runs, touchdowns, points or goals, and you’ll hear about it. I’m “guilty” of this myself. If someone set a record, it was bound to be around the top of my story – if not in the first paragraph. In the larger sense, the sports media serves as the historians of our fun and games. There are downsides to that. We’re the guys that remind players that their teams haven’t won a World Series since Harry Truman was President. Admittedly, the current members of the Chicago Cubs couldn’t be blamed for going from 1909 to 2016 without winning the title – but that’s probably what it felt like at times last season before they actually did won it all last fall. On the other hand, sometimes athletes are happy that someone is keeping track and doing the counting for them. You’ve probably been to some sporting event in which a record is broken, the game is stopped, and the player in question is handed a basketball or something while a photographer records the moment. Everyone likes to make a little history, even if it’s setting a record for forced fumbles at a very small college’s football team. But we all have a little problem with the problem of determining a meaningful record, and how it can be or should be obtained. The consecutive game streak is a good example of that. Lou Gehrig is rightfully celebrated for his skill and endurance in putting together a Hall of Fame career. He played in 2,130 consecutive games, which used to be right up there with 714 (home runs) as one of the magic numbers in baseball. Yet did you know that once Gehrig batted in the top of the first inning, and then immediately left the game? He was injured at the time, and wouldn’t have been able to play the whole game. So to keep the streak intact, Gehrig made a cameo appearance. Such tactics were used more than once. Researcher Raymond Gonzalez discovered that Gehrig was replaced by a pinch-hitter eight times, by a pinch-runner four times, and as a first baseman 64 times. Other streakers have taken similar steps to keep long streaks intact. If Gehrig had missed that game mentioned, he might have played 2,129 of 2,130 games – still a remarkable achievement. 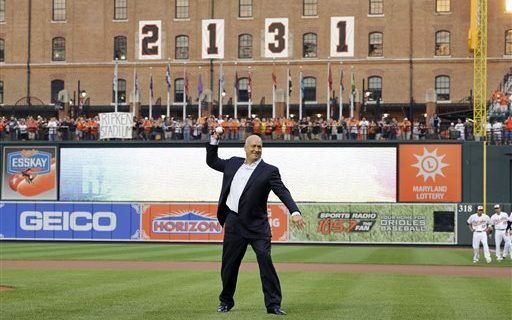 That’s why Cal Ripken gained extra credit with me for his streak of 2,632. He went whole seasons without missing an inning. You can argue that he could have used a little extra rest – and that’s the reason why players are sitting out games occasionally now early in their careers, so that the consecutive-game streaks don’t take on a life of their own. Yet Ripken points out that he always thought he could help the team by being on the field every day, and never took the easy way out. That’s a good argument. Then there are the records connected to high school sports, and that can turn into a discussion on sportsmanship. This comes every year in every region of the country, including the one we’re in here. Let’s face it – at that level teams aren’t always well-matched. Some players can score touchdowns, baskets and goals at will against bad opponents. Inevitably that leads to a record of some sort falling, and some discreet hard feelings. If my team is losing a football game by 63-0, am I impressed that a quarterback has stayed long enough in the game to throw nine touchdown passes? Probably not, no matter what might be said in public. You also have moments where an injured player falls short of a career or season scoring record by a basket (such close calls generally happen in basketball). So as soon as that player can more or less stand up (with or without crutches), a “pre-arranged” basket is set up at the start of the game so said person can be the new champion. That always felt odd to me. I can understand why some coaches tell players to stay on the field/court/floor in one-sided games in an attempt to break school/league/state records. The action brings attention to the player, coach, team and school, and that might help bring some scholarship dollars into play down the road. But if the point of the whole exercise is to win the game, shouldn’t we keep the focus there instead of worrying about individual records? I guess my point is that while records can be worth celebrating, they take on an added luster when accomplished within the context of the game and not for their own sake. If you see a record fall in the coming months, try to decide which side of the line that particular achievement falls.